There is a place that I feel most comfortable, it’s an “other world”. I go there when I’m quiet, usually sitting somewhere on my property, perched on an old tree stump or a rock – that’s my favourite place to sit…with mother earth. Every now and again I might hug a tree that speaks to me. Most often I find looking at all the tiny detail in a so called “weed” more interesting than the pretty flowers…or the bark on a tree – humming with life, you can feel its spirit. And when I’m in this place I feel the presence of others…it’s comforting. I close my eyes and my imagination then creates stories – it’s magickal. My “people” are there…in that place. I’m not one to have lots of friends, have never felt part of a “sisterhood” or “tribe” or whatever you want to call it. I am a loner, I do my own thing…always have. But what I do love is my world away from this earth bound existence. Oh don’t get me wrong, I have a great life here where I live, just I prefer the other. I find I am spending more time there as I look for peace in this world. I am landscaping some parts of my place, so I can sit among the rainforest plants and trees, because that’s where I converse with my girls, my soul group, my sisters. They have been with me for all time, lifetimes, even before time. It’s like they are a part of me, they are me. We are all one after all. This part of me is finding its way more into my art, I feel compelled to draw and paint that otherworld, or how I perceive it to “look” – if it has a look. I mean in reality it has no “look” just a feel. So I’m painting that feeling….and this class has that feeling. The beings from that otherworld. And there is something about watercolour and the powdery pigment of soft pastels that embodies the soft lovely feeling of that world, that’s inside all of us, our soul. Loose sketchy lines, no borders or boundaries….it all merges into one. 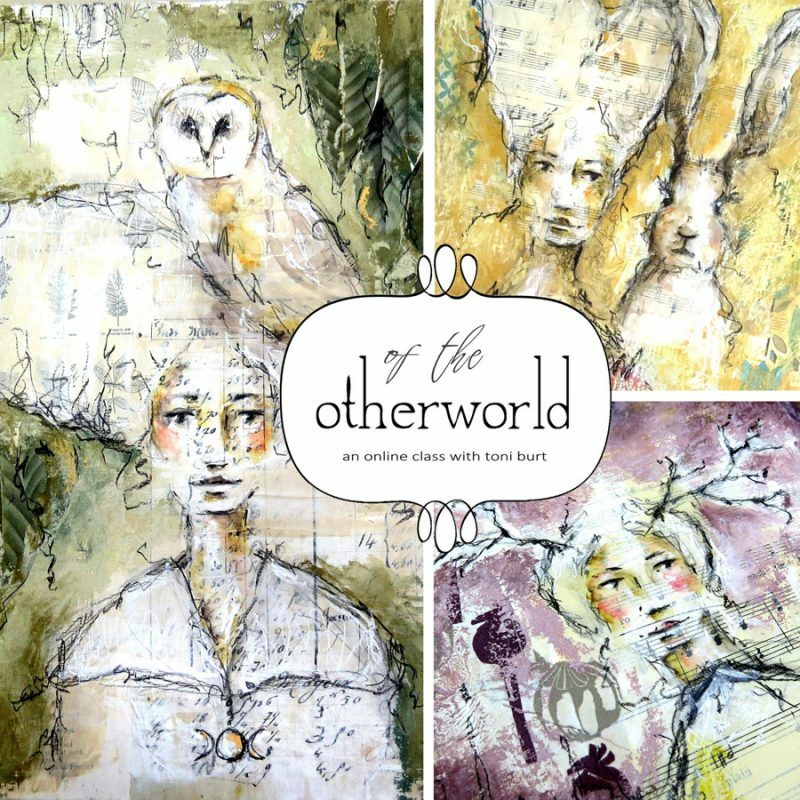 If you feel that otherworld too why not come and share my journey to create these three lovely girls…Oh, and the hare, and the moon, and the owl. class is now open for immediate arting! To celebrate I am giving away a complete set of three 8×10″ prints of the artworks above (includes worldwide shipping). Thank you so much everyone I have loved reading through your beautiful comments 🙂 Congratulations to Julie May who is the winner of the giveaway! 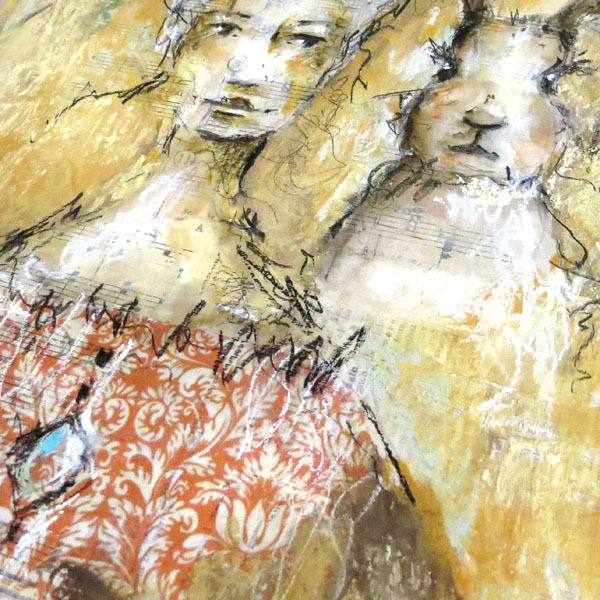 This looks like a magical class… shared with several “art sisters”… I’d love to win the art… it’s wonderful… signing up! I love these peices! Beautiful! I would be delighted to win three of your beautiful art prints. This class sounds amazing! Thank you for a chance to win. This looks like an amazing class. That bunny is my favorite. What a beautiful class this is going to be <3 thank you for sharing your art with us. What a beautiful class this is going to be <3 thank you for sharing your art with us.. Your art is so beautiful! I would be honored to win. Excited to enter this competition. Fingers crossed. I so relate to “the other world” & feel really connected to it whenever I walk thru “Hidden Grove” just minutes away from where I live where there are ancient giant trees, maple wetland & startling rocky promontories….I often speak to my friend about the elves & faeries living there…love your art & would be thrilled to learn more about your style & technique in painting these ethereal glimpses of fairyland. So beautiful. I love all three of them. Thank you for an opportunity to take one of your wonderful classes. Learn so much for each lesson. This looks like a fantastic class. I like the writing combined with the drawing and would like to try it one day. I just love your classes! My daughter cherishes the journal I made for her from your class. Your instructions are so well done and you answer all questions with sincerity. So we’ll meet again in In the Other World.! Toni , what a beautiful blog post & feeling you have shared through your art . I too know exactly what you talk about when you describe “The other world ” & sometimes I prefer that place than here but know that I am here to make a difference & bring peace and love but know I can always escape to this place when I need to , it’s very comforting. Toni, I love your art. So soft, warm and inviting. Would love to win this giveaway. Thank you for the opportunity to win. Beautifully inspirational. Would love to learn your technique. Thank you for offering this wonderful giveaway, Toni! I love your process and this class look like something that would bring me much joy. I love all things, bunnies! I was born in April, so as a child people would always give me stuffed bunnies as gifts. Love to win your class, your Art is beautiful!! I love Toni’s art! If you are thinking of taking a class do it. She teaches so well. It’s like your standing beside her and she is giving you her undivided attention and knowledge .If I could I would take every class that she offered and own every print she sells!!!!!! Her work is amazing! This class looks amazing. I would love to learn from you. Would love to win a print. Thanks for the chance. All beauties, Toni! I love your post. I can see that in your artwork and it’s mesmerizing! Another beautiful class, Toni! Your work is amazing. your work is very intriguing, I would love to incorporate your techniques into my work. I love how “otherwordly” it is! This looks like an amazing class. It would be so much fun! This class is just so magical! How I would love to win – and my daughters and I would be so grateful for the prints. Thank you Toni! Beautiful works of art! Just gorgeous! I’ll have to look into your class; it would be wonderful to learn some new techniques and I’ve not worked with pastels very much. It would be great to be able to do one of your classes. If you are trying to decide whether to take a course from Tony, DO IT! You won’t be disappointed. I’ve thoroughly enjoyed the classes I have purchased. I can rewind and watch parts over and work through the techniques at my own pace with no pressure to keep up with anyone else. This class looks like it will definitely get your creativity flowing! I love the magical qualities of the subjects. Thanks, Toni, for sharing your talents! Oh Toni it would be amazing to win one of your classes. Your work inspires me. Toni, thankyou for sharing such a beautiful story about your ‘other world’ , I found it beautifully touching. This class, like all your others looks wonderful, but I think this one has something extra special in it for us to be able to find our own ‘magickal’ world. Am putting it on my ‘to do’ list for sure. Or maybe I’ll be lucky to win the prints, how delightful! !